This flexible, lightweight binder is fabricated with stiff covers and engineered to stand upright on a variety of surfaces. Grab this binder on the run by reaching for its handy spine-drilled finger hole. Identify the contents of your binder quickly with this unique slide-on, slide off spine label holder. Corner Lock™ feature keeps papers from falling out of pockets. Four inside pockets for greater organization. 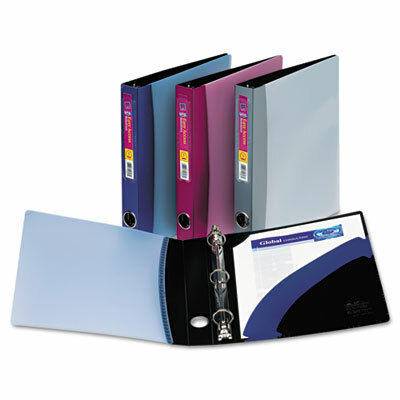 This flexible, lightweight binder is fabricated with stiff covers and engineered to stand upright on a variety of surfaces. Gap Free™ feature prevents ring misalignment so pages turn smoothly. Grab this binder on the run by reaching for its handy spine-drilled finger hole. Identify the contents of your binder quickly with this unique slide-on, slide off spine label holder. Corner Lock™ feature keeps papers from falling out of pockets. Four inside pockets for greater organization. PVC-free.